Do you have the number of high-quality prospects you need to not just make your annual number but exceed it? The more you can tailor your process to the specific needs of your prospects and “types” (industries, departments, etc. ), the more successful you’ll be. Example: One type of prospect might be looking to buy based on the need to grow their business, while another might be buying to replace your competitor. Segmentation is more important than ever and it must start at the prospecting level. 2. Develop your prospecting calendar to allow you to focus on one specific type of customer or need at a time. Example: A salesperson who is actively selling to 4 different industries may focus one week per month on each industry. Doing so allows you to develop a level of comfort and to use information learned from one prospect to help with another in the same industry. 3. 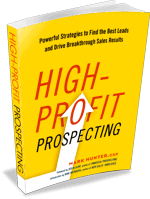 Develop 10 questions for each type of prospect you might encounter. It’s not what you say that is going to get you a customer, it’s what the customer says to you that will get you a customer. Your prospect can learn all they want from the Internet. That’s not your job. Your job is to ask questions to create dialogue. When prospecting, you’re contacting people who aren’t expecting you, so make your goal reasonable. Focus on gaining one piece of information from the prospect and secure a time for a more in-depth discussion. Your response to that statement must be strong and immediate about how what you want is a conversation to understand their needs. 6. As you develop your pipeline, allocate your time to ensure you can spend time on both prospects that might be smaller in size but you can close quickly, as well as the large opportunities that will take months to close. Being balanced is essential. The quick close prospects will keep you motivated as you go after the larger, long-term opportunities. 7. Make prospecting your focus. If you also manage existing accounts, use the following formula as your guide: A salesperson may have 30 existing accounts of which the top 5 deliver 60%, while the other 25 deliver the remaining 40%. The total amount of time the salesperson should spend on all of the existing accounts is 60%. The remaining 40% is for prospecting. Be sure to join me January 12 for a webinar on Building Your Prospecting Plan for 2017! I will be digging into this issue of developing your prospecting/sales growth plan for 2017. Sign up even if you can’t make it, as I’ll be sure to get you the replay of the event. Most of all, let’s make 2017 an absolutely fantastic year!